I've kept a Dwarf since end of August, life span is short around a year and usuall unknown age on purchase adds to the delema. Are very nocturnal, I use lower blue lighting tho also some fish. So far his staple diet is hermits least 5 a week fed 2 then 3. Caught a rare view of him this morning blended in on the rock, but lights on scurys away. Use a red light to view in evenings. Loads of fun. Need minimum of 20 gallon tho 30 and above suggested. Needs rock to hide in, weight the lid as great escape artists? Rare view but stayed in the light as obviously snagged a hermit! Last edited by wnppmy; 01/08/2013 at 05:43 AM. Actually enjoying mine, viewed this morning with red light. Waiting for the Friday supply of hermits. The $32 paid for him thought was rather reasonable. Only downside to me is are nocturnal so unlikely to see him daytime. Does a good job on sifting the sand bed, easy to trace his evening ventures. Expense is the continual supply of hermits. My Dwarf is doing far better than I expected todate. I did switch to a lower level blue light so far doing fine, no algae issues last several months. The low illumination perhaps agreeable to the Dwarf, Fish are ok and just enough for mushroom and even a pipe organ soft coral. They won't outgrow a 20g ? only the smallest nocturnal dwarfs are ok in a 20-30g tank but other aquairum suitable species like aculeatus,biraieus and vulgarus require a 65-125g tank, 125 minimum for vulgarus. i put a very small (3inch full armspan) babby aculeatus in a 45g hex tank and within 2 months he had totaly outgrown the tank and was constantly looking for an eacape after moving him to a 72 he settled down and was content in his new home. becides the space requierments octos produce alot of waste and put a bigger bioload on a tank that other animals so they require more water volume and filter capacity than fish or corals. most experienced keepers recomend a protien skimmer rated for 2-3x the volume of the tank to handle the extra waste and the posability of a large inking. 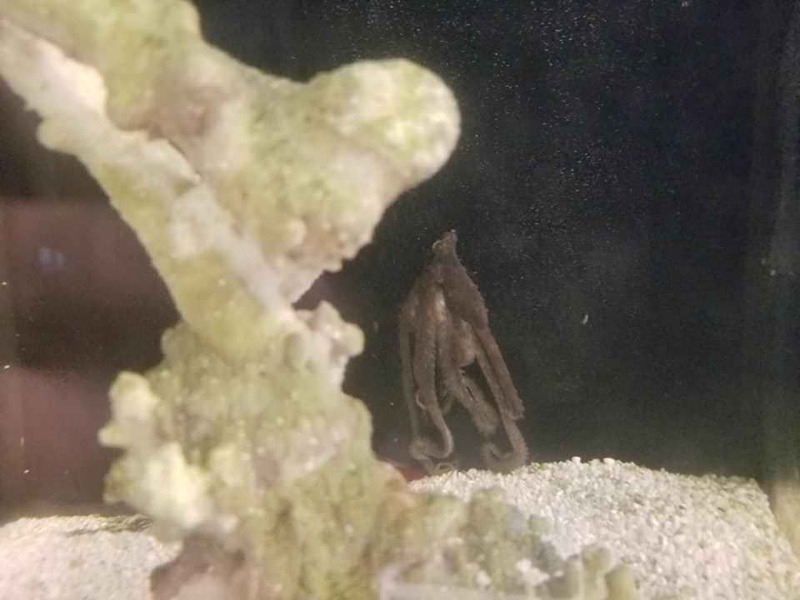 Just for info have the smaller Dwarf Octopus, mines in an undersized 14G Bio. Tho glimpses in early morning prior to daybreak fun to catch him eating his favored meal, hermits. Mine purchased last year in August. Life span can be short but wouldn't trade the experience with this one. Arrived unannounced at local pet shop, unable to resist. Don't suggest this small of tank, but an established tank at least 6 months before introducing one likely a priority. Be sure is rock for hiding, essential for this nocturnal guy. Skimmers are suggested, my established system handles the bio load todate, but do weekly water change, not over 10 percent, unless needed abit more monthly, I monitor the soft coral etc. Originally posted by Serra : I have a question. How do you drag race marine aquariums? I want one too. Which one should I get? I have an 8g nano and a 273.6g. What's the longest someone has kept one for? Octopuses are short-lived; don't expect to keep one for more than a few months to a year, depending on how old yours is when you acquire it. I have an A. aculeatus in one of my office tanks (not listed in my sig), and I spent almost a year prepping the tank for his arrival, with the understanding that I'd likely only have a few months with him. 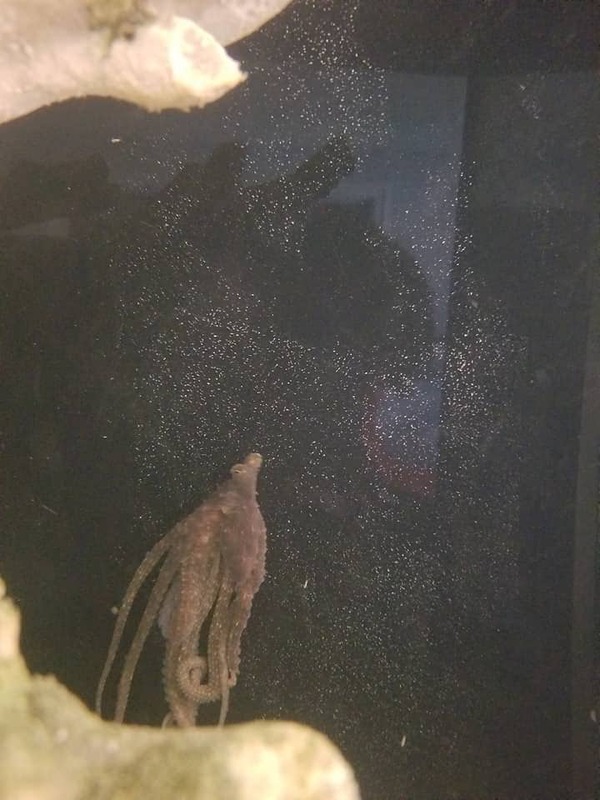 The best current all-in-one info source on keeping cephalopods is "Cephalopods: Octopuses and Cuttlefish for the Home Aquarium", and tonmo.com's forums are the place to ask questions. About 10 years ago I got a bimac and within a few day it laid eggs. Stopped eating and died a few weeks later. Second one was the most amazing pet I've ever had. I had him for 8 months. I remember getting some bait fish on a weekend trip and bringing them back for him. The small fish were very fast and he couldn't catch them in the open tank, but I would watch him think. Amazing. I saw him swim up when the fish was almost over top of him, and in its blind spot. He got it with the last two suckers on his tentacle and slowly caught them all. 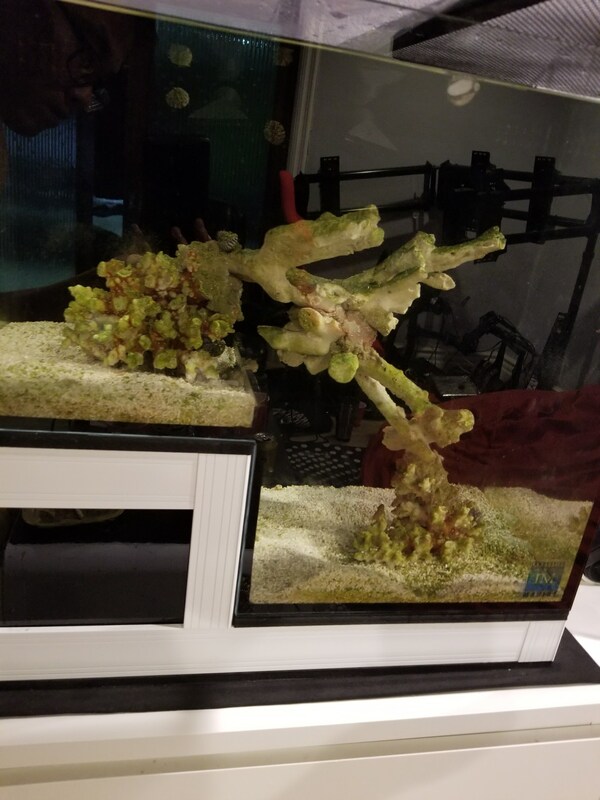 60 Rimless, Hydra 26, eshopps sump, color box heads, Sicci return pump. Wow, I never knew that they were so short lived! I've caught some while fishing and kept them in tank. They lived from 6-18 months. But they were good sized when I caught them. when they lay eggs, it's goodbye time. the smaller eggs are impossible to hatch. the big ones are possible if they have been fertilized. they prefer crabs and shrimps. I go Asian supermarket and buy live crabs for them to eat. If not, frozen shrimps will do. their grip is really strong and they do bite! but most times they will just escape. Once one of them shot out ink. The ink will not damage the octopus, but you should run carbon asap. had a 14" octopus grab my arm and I couldn't free my arm. octopus are really smart. you need to get toys for them to figure out. usually balls with different sized holes or even locking device. Put some food inside and keep them busy. They will try to escape out of tiny slits. One went halfway into my output nozzle. I currently have a baby, about 2-3 inches big. they are not very active. specially during daytime. Most times you will be staring at an empty tank, looking for the Octo. Last edited by m0nkie; 04/25/2018 at 02:02 AM. I've kept two that were sourced out of the Florida Keys. Both lasted over a year. It depends on what time of the year you purchase them as most are seasonal breeders but there is also a factor of luck involved. I've successfully kept (over 1 year for all, some longer) Wunderpus, Bimacs, Blue Rings and Mimics over the years... Minus the obvious risk with the blue rings, I found them to be VERY easy to keep. Wunderpus were easy, as well. The mimics were the most personable out of the bunch, also seemed to be the most intelligent and would interact with you. I'd be glad to discuss what worked well with any of these species if you folks are interested. I used to keep a octopus they are very sneaky. Hello - I would love some advice. Hopefully this link works for my recent experience. Biggest issue I am having is where to get a good octopus? There are Wonderpus and Mimics available now but I thought they were not as interactive. I am looking for a Bimac but can't find one. You may receive any variety of octopus and even within the same subspecies, individuals have a range of dispositions from shy to bold. Try to get in touch with the business before you order it and ask questions. Where did it come from? How big is it? Do you see these kind often? Some divers know what they are looking at. Salty bottom reef company has O. vulgaris, O. briareus, and O. mercatoris listed. They don't have O. vulgaris in-stock currently though, I tried. O. mercatoris are a pygmy species and only active late at night so I wouldn't get one of those if you want interaction. O. briareus are typically nocturnal but will adapt to your activity once they learn you give them food. And they get fairly large, 24" arms potentially. Saltwaterfish.com has Indonesian/Pacific species. These are most often Abdopus species. The ones I've kept were gravid females who hid, laid eggs, and died soon after purchase. They are typically very active once acclimated though. I've also received Abdopus from Liveaquaria. I just ordered the 2xPacificOctopus from Yourfishstore.com and I figure it's a roll of the dice. I asked in an email a while back why they sell 2 together and they say they keep them all in a tank together and it works out okay. *shrug* O. mercatoris can be kept in a community so who knows. General rule is solitary. I've kept an abdopus with fish peacefully, so maybe. Current Tank Info: 60 gallon cube, w/ 30 gallon sump, octopus-proof lid. Dry for now.